Nepal Relief Fund Update - Let's work Together! Donate today! 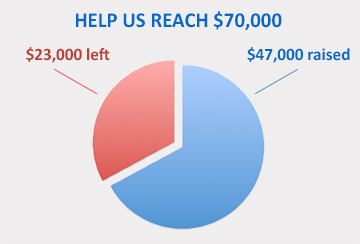 With your help, we have made great progress towards our goal of $70,000. Thus far, we have raised $47,000, which is quite an achievement, let's cross the finish line together! "Aid agencies 'running against the clock' in Nepal"
"Two earthquakes less than 3 weeks apart"
"Second Nepal earthquake forces 1000's to sleep on streets"
The death toll has now climbed above 8,500, with at least 20,000 injured. And it’s expected to rise further, with more believed to be buried in debris which was sent tumbling again by the second, 7.3-magnitude temblor that struck on May 12, 2015 after the first, 7.8 magnitude, earthquake that initially struck an area between Kathmandu, and the city of Pokhara in Nepal. The second quake “compounded an already seriously distressing situation,” according to James McGoldrick, the United Nations’ humanitarian coordinator for Nepal. High levels of damage have now added to the already massive need for shelter, water, and food. Over 500,000 houses and countless other structures have been wrecked across the country. JAINA’s World Community Services Committee has launched a fund for the victims of this unfathomable tragedy and is asking the Jains of North America to contribute. The funds will be used for a humanitarian project that will be selected & executed against once the relief operations ends and rehabilitation work begins. Your donations will be used for humanitarian projects that will be selected & executed against once the relief operations ends and rehabilitation work begins. Currently we have identified two projects. The first is a building a school (working with Veeryatan) the second is building a hospital (working with Bharatiya Jain Sanghatana – BJS). If each of us donates at least $20, we will reach (and exceed) our target and be able to support many more projects while letting the international community know that we as a community not only care, but that we take action when it counts. Thank you for your generosity and ongoing support!